The studio is filled with pianos, early keyboard instruments built by Chet Noll. 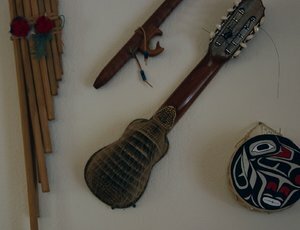 Instruments from around the world adorn the walls of the studio. Replica of a fortepiano from Mozart's era, built by Chet. L. is having so much fun in piano and trumpet. Tim, Roger and Chet are wonderful, inspiring teachers. L. literally does not want to stop, even in summer or vacations. We are so grateful that Keyboard Art exists here in Wrightwood. You have a couple of dedicated fans in our family. We are ALWAYS available to help in any way.